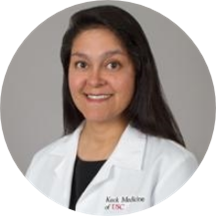 Mabel Vasquez MD is an Assistant Professor in the Department of Medicine at the Keck School of Medicine of USC. She received her master's degree in public health from the Harvard School of Public Health and concurrently received her medical degree at Harvard Medical School. Dr. Vasquez completed her Internal Medicine internship and residency training at LAC + USC Medical Center where she served an additional year as Chief Resident. She is board certified in Internal Medicine. Her clinical interests include women's health and internal medicine. Throughout her career Dr. Vasquez has shown a commitment to community service. She is a former playground tutor and assistant grounds supervisor for the LA Unified School District a tutor at Mission Hill Community Center and is currently on the Ethics Resource Committee at LAC+USC Medical Center.